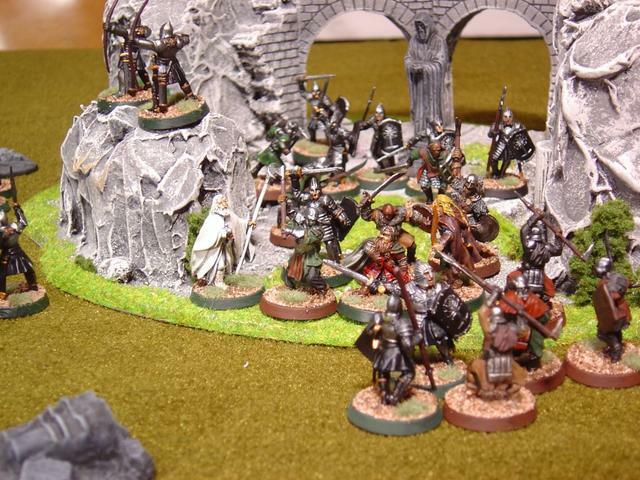 Terrain building for miniature wargames is an art in itself, one that you’re either really good at, or really bad at. Personally, I’m one of the few that end up somewhere in between, as I have enough modeling talent to paint terrain pieces, and to make a few boards of my own if I’m in a pinch, but I would much rather purchase eye catching terrain pieces and boards that are already finished and ready for play. The problem is that there are not a lot of companies out there, at least that gaming enthusiasts know of where one could purchase some nice looking terrain that’s ready for action right out of the box. Sure Games Workshop offers a few ready to go pieces every now and again, and how could I ever overlook the outstanding stuff from companies like Armorcast, JR Miniatures and the like, but those products are kits and pieces that require priming, assembly and painting. What’s a guy to do? 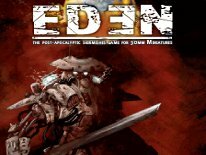 I’ve looked long and hard for a company that offers terrain that’s ready to go right out of the box, and aside from Dwarven Forge, there’s only one other alternative that has what most miniature wargaming enthusiasts are looking for, and ESLO terrain, at www.Gelaendestuecke.de is that company. They’re out of Germany, but don’t let that keep you away, because these guys have some of the most stunning and most cost effective pieces of terrain out there, and even coming all the way from Germany, the items showed up packed with extreme care, every piece completely intact, and ready for some serious gaming the moment the shipment arrived! That’s pretty amazing considering how far it traveled, so they definitely get an A for packing and delivery. If you’re looking to put together a new gaming board from scratch, the best way to start is by selecting from their modular terrain boards section. They offer a wide variety of 50cmX50cm and 25cmX50cm tiles in everything from grass and desert to snow and wasteland-like terrain patterns, very cool stuff indeed. To add some terrain to the table we opted for one of their Snowy Rocks formations ($14), Medium Snowy Hill ($15) and Large Snowy Hill ($20). All three pieces perfectly match the snowy modular terrain boards, and each is made of durable materials, sealed for extended gaming use. Both of the Hill pieces come with trees, which can be removed from the base for storage. That’s a nice touch. Each piece comes in its own box, so storing them away once you’re done is as easy as putting them back in their boxes, with an exception to the largest hill, as it came bagged, but it’s not too tough finding a place to tuck it away. What I put together here is enough pieces for building a very versatile a outstanding looking board for playing everything from Mage Knight and Mechwarrior to Warmachine, Flames of War, Lord of the Rings, Dogs of War, 40k in a flash and CAV in a snowy and tundra-like setting. 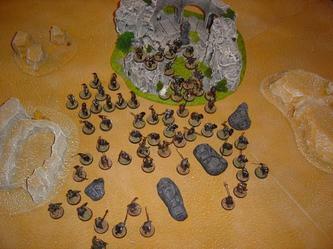 I’m sure there are other games that could make use of this outstanding terrain just the same too, as most pieces aren’t scale specific (aside from maybe the desert ruined stucco house piece and the ruined monastery), therefore the hills, boards, and many of the pieces that they offer can be used for multiple gaming systems. To put together a nice desert setting we opted for a Desert Rocks ($14), Desert Rocks 2 ($23), Desert Large Rocky Hill ($17) and Ruined Stucco House ($38) pieces, all of which perfectly compliment each other when combined with the Desert modular terrain boards, which also like the snowy boards, perfectly match the basing of the desert terrain pieces. The Ruined Stucco House is the priciest piece of the bunch, but is ultra detailed with wooden beams and enough room inside to accommodate a small 25-28mm force. 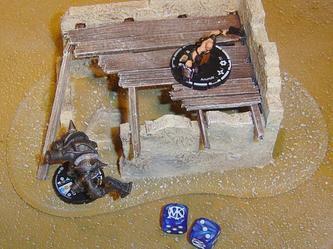 This piece is perfectly suited for Dogs of War, the modern military combat miniatures game from Devil Dog Design, which the pictures that accompany this article detail. In addition the Desert Rocks 2 looks somewhat like a small bunker, at the very least damn good cover for some figures, and it just looks the part on the table. The hills, like everything else we’ve looked at, are outstanding pieces of terrain too, especially for the money. 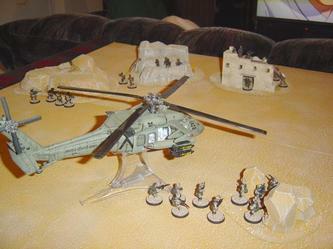 The desert board I put together is ideal for Dogs of War, with US Rangers and Afghanistan troops fighting it out in the desert, and it was equally as ideal for my own homebrewed Black Hawk Down scenario against the Somali Militia with Dogs of War as well. Again, that’s only one example of how the desert board can be used, as I’ve played many hours of 40k in a flash, Mage Knight, Mechwarrior and Lord of the Rings on the board too, and I’m yet to get tired of marveling at the outstanding craftsmanship that goes into every piece of this terrain while playing. Being a big Games Workshop Lord of the Rings Strategy Battle Game enthusiast, this next piece couldn’t go overlooked. The Ruined Monastery sure looks a whole lot like the perfect stand in for Weather Top, and at $63 it may be the most expensive piece yet, but it’s by far the nicest and most visually stunning piece of the bunch. It’s truly worth every penny. It’s a rather large piece too, and it also has a box to store it in when you’re not gaming with it, which is a big plus. Drop this piece in the middle of a table, and some eyes will definitely turn quick. 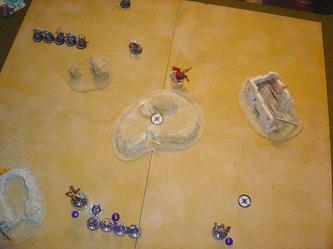 It really makes a nice objective for 40k, Warhammer Fantasy, Dogs of War, Warmachine and the like. I’ve also found it very useful as a backdrop when taking digital photos of my miniatures, it’s really that nice of a piece. Like everything else covered thus far, it too is mounted to a firm board, and the flocking and terrain doesn’t come up easily, so it can withstand many, many hours of gaming abuse. It doesn’t end there either, as these guys are spreading out, because a few gaming retailers here in the US are now carrying their terrain products, which makes it that much easier and faster to get your hands on some professionally made, ultra-detailed, ready to play right out of the box, gaming terrain, at fair prices. At present I believe Tin Dictator and Miniature Headquarters are the only US retailers at present, both of which can be found online. They offer so much more in the way of terrain pieces too, as one could easily put together a few tables-worth of superb gaming terrain, for around $200, or less. Lets do the math, for roughly $325 in their terrain products I’m able to put together not only two very distinct gaming tables, one for desert and one for snowy environments, but one could easily mix and match these pieces in with what is already on-hand (for example, using Miniature Building Authority, Armorcast and JR Miniatures buildings and accessories along side the ELSO terrain). 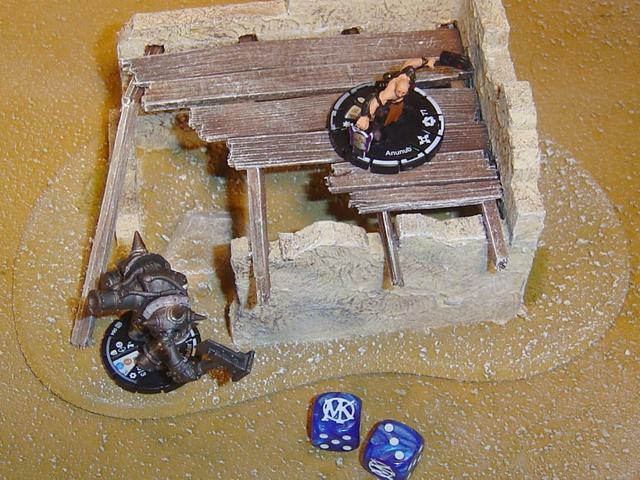 The Ruined Monastery is also the perfect centerpiece for any gaming table, giving me a center piece to build a third table from. 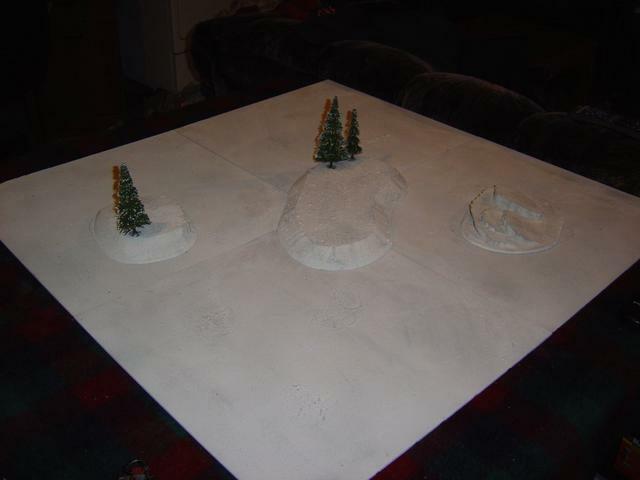 Using a felt gaming mat, or a flocked gaming mat instead of utilizing the modular terrain boards works just a nicely as well with their terrain, and allows you to spend more money on terrain if money is tight. However, after playing with their tiles, it’s tough to appreciate the old cloth mat now. ;-) All in all they definitely have a little something for everyone, and nothing from them should be overlooked if you’re in the market for a new board, or if you just want to pick up some terrain to spice up your current gaming table arrangement. What’s more, they’re always putting out new pieces, and they also offer package deals on complete themed tables, so be sure to check out their website for more info. The above article was originally posted at GamingReport.com in the summer of 2003. Since then ESLO has expanded quite a bit, and now create even more amazing ready to go, pre-painted terrain pieces. They now offer 15mm and 20mm terrain, in addition to an ever growing 25mm-30mm line, which I originally reviewed above. I was planning to revisit ESLO terrain soon, if all goes as planned. There's also a lot more US retailers carrying their products now, so the it's a little easier to find than before. Back in 2004 the only option you had was ordering direct from them. Some of the new stuff looks equally as amazing too, especially the 15mm stuff, and some of the castles.